For Malika Junaid, co-founder and principal architect of M Designs in Los Altos, boundaries between indoor and outdoor fade behind an attitude that anything is possible. 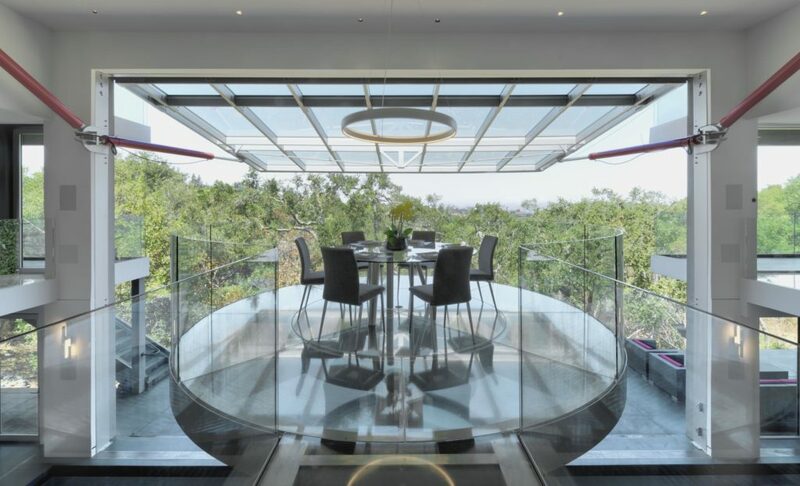 Take, for example, the solar-powered airport hangar door that opens to the scenic view of her Los Altos Hills home, as if you could take flight straight over the bay. “It was important for me to design the house so that it merges with the environment,” Junaid says. That meant working closely with M Designs’ structural engineers to design the door to withstand a high-end aluminum finish and double-pane glass with an awning-style lift. Not knowing what it would ultimately cost, Junaid kept a buffer in terms of the house’s overall $10 million budget and was pleased when they came in just under the estimate. “She does not see barriers,” says her husband, Junaid Qurashi, an engineer turned tech investor who helped the design-minded partners on the business side of things. The two met through a likely source: their moms, both pioneering women in their own right. Junaid’s mom was the first female television host in Pakistan (she is now a senator there), and Qurashi’s mother was one of the first female TV producers/directors in the country. Both grew up in Pakistan, although Qurashi moved to the United States as a teenager. But after a brief stint there, Junaid came to the U.S. in 1995 seeking a more tech-forward curriculum and ultimately earned her degree at Louisiana State University, despite warnings from friends abroad to avoid the Southern U.S.
After graduating, she moved back home to Pakistan and worked for two years. It took Qurashi a year to persuade Junaid to marry him and move back to the United States in 2001, right around her 26th birthday. “When he sets his mind on something, there is no moving him,” jokes Junaid. She took her husband’s first name rather than last name as her surname — “I wanted to take his mom’s but that was a bit too unusual,” she says. Junaid was in the process of launching M. Designs as well as finishing a home in downtown Los Altos for her growing family (she was pregnant with her second child). It was her first experiment incorporating sustainable features that were also cost-effective (rainwater harvesting, solar energy, designing for orientation to make air conditioning unnecessary). It was also one of the first green-certified homes in Los Altos. “Although unintentional, it was an amazing thing for us to have for marketing,” she says. Placing herself at the forefront of sustainable architecture — this was before California building codes and requirements changed in favor of the planet — Junaid founded the Green Learning Institute in 2009. “We realized that we didn’t know a lot about the technical part of sustainability, so we started training classes to understand what green is and do you really need to break your bank to achieve this?” A year later, she was awarded an Environmental Quality Award from Menlo Park for the single-family home that she designed in the city for client. The design process for Junaid’s Los Alto Hills home, where they moved last summer, became a family affair. Qurashi’s “Star Trek” fandom inspired the Enterprise-like dining table, suspended over the indoor swimming pool, which features a tile mosaic of “The Creation of Adam” (Junaid’s favorite painting). The pneumatic vacuum elevator — which operates without cables or pulleys — continued the “Star Trek” theme, an idea that formed during a family trip to the International Builders’ Show in Las Vegas. Nearly everything in the house is electrical and solar-powered, she notes. While most parents lament the teen years when closed doors become a thing, Junaid and her husband figured out a life hack — designing a completely open space, encompassing the kitchen, living space, dining space and the family’s neighboring study spaces. “I think technology is doing enough to separate families,” says Junaid. Designing with family in mind and certainly the lifestyles of her clients, including executives from Apple, Facebook and Google, takes precedence over Junaid’s personal aesthetic. “She is attuned to people’s anxieties and their concerns, and for that matter, she is really good at opening people’s eyes to what’s possible,” says Jessup. Case in point: a client who requested a replica of a house she had already designed. Her commercial and residential work ranges from the futuristic appeal of her current home to the traditional, inspired by her home country and travels to Europe, but one commonality remains: They are centered around open spaces and a sensible approach to sustainability. But which of the many is her favorite?